This online document might be outdated. 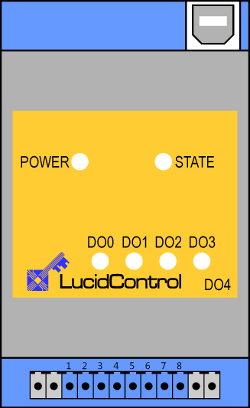 Please see the LucidControl USB Analog Input Module PDF documentation instead. Fig. 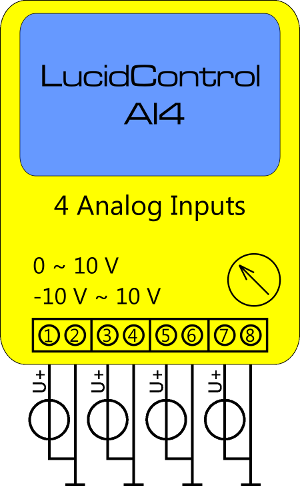 2-1 shows the sketch of the USB Analog Input Module with 4 analog voltage inputs (AI0 ~ AI3). While the upper USB connector is used for interconnection with the computer, the lower IO-Connector is used for inputs and outputs. The IO-Connector provides 8 terminals in total – two for each input. LucidControl USB Analog Input modules are available in different options covering positive and negative input signals. The module can measure voltages within the range VMin to VMax. LucidControl AI4 is rated with a maximum current of 40 mA. Fig. 2.2.2-1 shows the interconnection of the module in a typical application. The analog input voltages are represented by voltage sources of voltages within the valid range. The terminals 2, 4, 6 and 8 are internally connected to ground.